Use scroll bar to see all colors - best seen in landscape view. Why is Zauberball crazy? Two individually dyed, self-striping strands are plied together to make variegated self-striping madness. You'll have endless fun watching Zauberball Crazy create unique color variations in your projects. This Schoppel Wolle Sock Yarn amazes knitters with its self-striping color variety. Zauberball Crazy is fabulous for striped shawls, hats and socks and is a popular choice for entrelac. 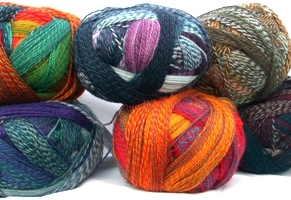 This superwash wool nylon sock yarn is machine washable, durable and very fun to knit. You can earn 19 ABUNDANT POINTS on this product! Need to purchase multiple colors? Click here. This intriguing Zauberball Crazy pattern is free fromHeddi Craft Designs. Click here to view this pattern.